The next quilt up on my To Make list is another 100 Good Wishes Quilt for a friend's daughter. I've worked out the plan and the math and while I wait to hear back from her as to whether or not the plan and final size is what she is looking for, I figured that I'd start cutting pieces for another quilt that I just designed over the weekend. Monday during the huge snowstorm (we got another 12" of the white stuff) turned out to be the perfect day to pull out and sort through some of my scraps and get them cut into usable pieces. 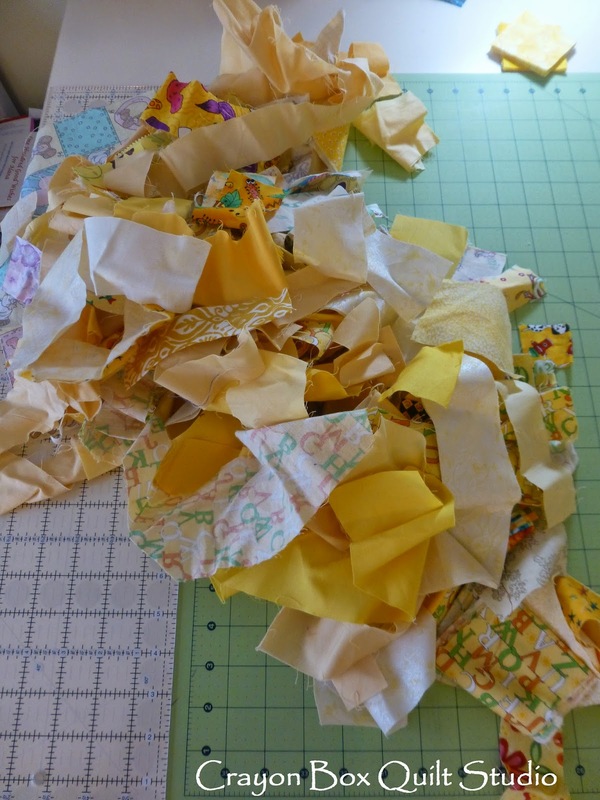 I started with this pile of Yellow scraps. These things multiply worse than bunnies and my scrap bins have long been overflowing and needing my attention. My niece is expecting another baby over the summer so this one will be for her. One thing I've learned about myself over the last year is that it doesn't work for me to cut my scraps into random sizes and then just stack in a box them away for some future unknown project. 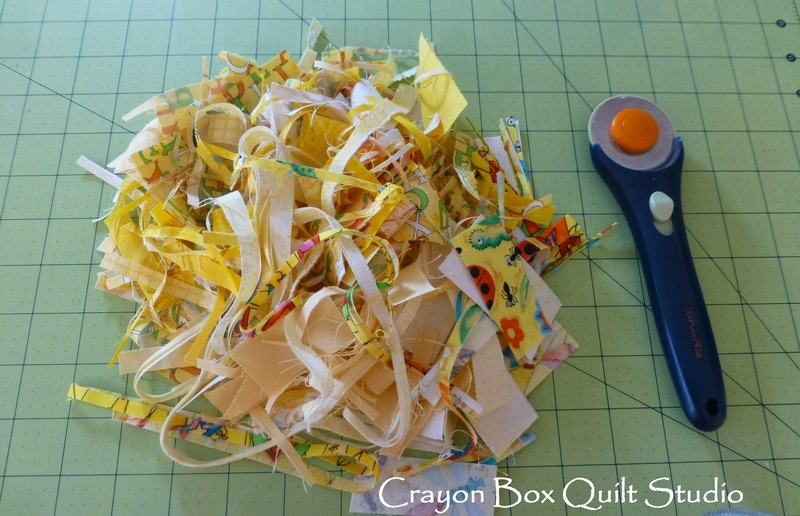 I tried that when I started the Rainbow Scrap Challenge last winter and I got really tired of cutting up all those Blue scraps and eventually put them back where they came from. What I now do instead is I actually pick a specific project and cut only the pieces needed for that quilt. It saves me a lot of time since I'm only pulling out pieces big enough to give me the size blocks I need plus I'm actually using the scraps instead of them just continuing to wait. What is left goes back into the scrap bins for the next go around. And since I already have a plan in mind for the smaller bits, the next go around won't be that far behind. So after some ironing and a few hours of cutting this is what I have to show for my efforts. Nice stacks of over 300 mini charms. This is more than I need for the quilt that I designed but I already have a plan in place too for those extra 2 1/2 " x 2 1/2" squares. It feels good to know that I'm going to make a huge dent in reducing my scraps. This is all that was left after the cutting and trimming and I didn't mind tossing out these tiny bits at all. 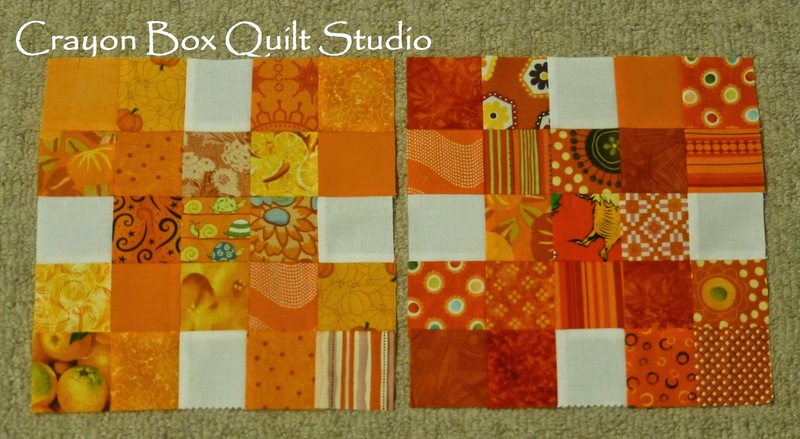 I even got to finally sew together my Orange blocks for the Rainbow Scrap Challenge...the 2014 version that is. Last year once summer hit and too many deadline projects loomed, this project got put aside but I'm happy to say that I've just got one more pair of blocks to make and then I can get working on turning them into a finished quilt top. So how do you deal with your scraps? Do you just let them continue to pile up? Do you cut them down into specific sizes and then find a use for them eventually? That is what my sister Tina does (who BTW just changed the look of her blog. Go check it out.) Are you good about using up every possible bit of fabric before you throw those last minuscule bits of thread in the trash can? I'm interested in hearing what has worked for you. And the We Support You Blog Hop is still going on. Pop on over to Sew We Quilt to find the links to each of this week's bloggers. There are some really terrific projects being shared, all in the name of supporting those with Breast Cancer. I'm still in the stage of thinking of what to do with my scraps. Right now they are in a hugh container. Occasionally, they yell at me, "What are you going to do with us?" But I pretend I don't hear them pleading to be used up. Wow - that's a lot of cutting! I did get my scraps organized by color, and I'm working on a couple of long term projects to use them up. I don't cut until I have a plan. I'm making hexies, Dresdens, and many other patterns. I barely made a dent in my blue scraps in January, despite making a doll quilt, 12 placemats, a Dresden plate for a future quilt, etc. RSC15 should be very good for me. Can't wait to see how all your little squares turn out. 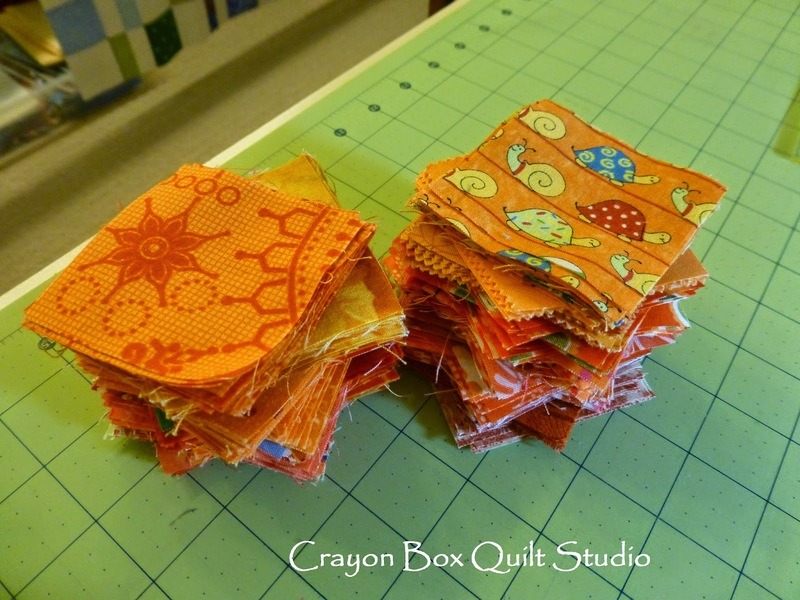 I've recently begun quilting - in the last year, but I have a healthy bunch of scraps multiplying in my studio space. I started just throwing them in a drawer - but that got messy and as it grew I knew I was getting into trouble - LOL. 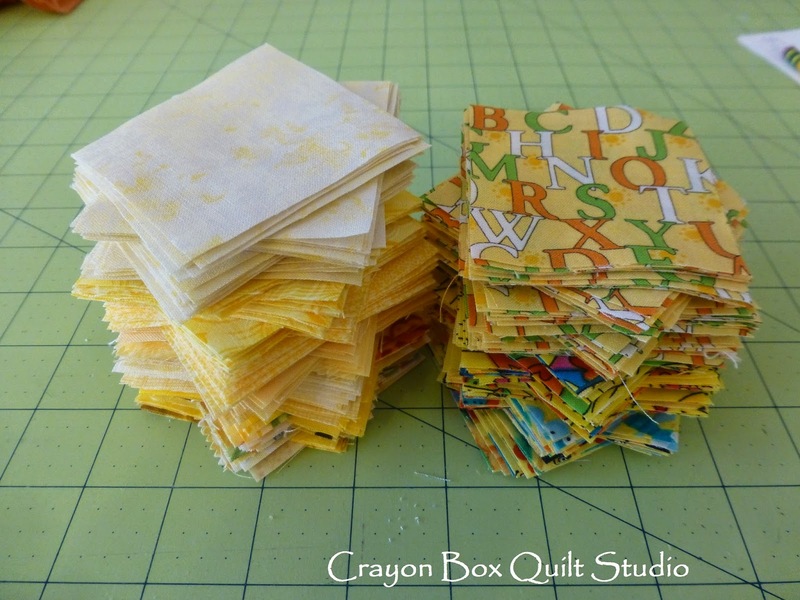 I started trying to cut as I went along - when done cutting for a project- I cut the largest pieces possible right then and there - usually 5" squares and stacking them neatly in one big pile. This worked great - FOR AWHILE - until one time I didn't do that - and you can imagine what happened then! Now I have a huge mess - I just bought some more plastic storage bins and am trying to figure out just how I want to manage this issue. How do you store your scraps? I deal with my scraps the way you do, they are sorted by color. I am afraid to cut them, what if I needed a different size but it was too small. I donate the little scraps to a lady who makes dog beds for a shelter. Or toss them outside for some beautiful bird nests! I have several steps in my fabric food chain - it is designed around what works for me. I have 'go to' blocks' and designs that I know that all of this will eventurally be used right down to the last skinny bit. My scrap mostly going into one big pile in a basket that my kids have free access to. I have some special scraps I set aside, but mostly I let the kids use them. Scraps DO multiply faster than bunnies. I keep mine by colors and size. I doubt there is one perfect way to do it. Wow 300 is a lot. Good for you for using up your scraps! I have three bins large,small and strips full of random colous.